Definition at line 12 of file BinarySmtlibSolver.h. This object will communicate with the SMT solver using SMT-LIB version 2 text files, both for input to the solver and expected output from the solver. Diagnostics from the solver (standard error) are not redirected by the ROSE library. A separate invocation of the solver is used for each satisfiability check. The executable should be the name of the solver executable, either to be found in $PATH or an absolute file name. Beware that some tools might change directories as they run, so absolute names are usually best. The optional shellArgs are the list of extra arguments to pass to the solver. WARNING: the entire command is pass to popen, which will invoke a shell to process the executable name and arguments; appropriate escaping of shell meta characters is the responsibility of the caller. Definition at line 41 of file BinarySmtlibSolver.h. Creates a new solver like this one. Definition at line 49 of file BinarySmtlibSolver.h. 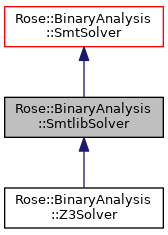 References instance(), Rose::BinaryAnalysis::SmtSolver::linkage(), and Rose::BinaryAnalysis::SmtSolver::name(). Each OP_SET needs a free variable to choose from the available members of the set. This function sets (two arguments) or retrives (one argument) the variable associated with a set.